GRAVENHURST — Waking up Monday morning after a weekend of snow to find a burning bylaw now in effect, is no April Fool’s joke. The Town of Gravenhurst reminds everyone, now that spring is officially here (even if it doesn’t look or feel like it) that there are rules around appropriate outdoor fire use. 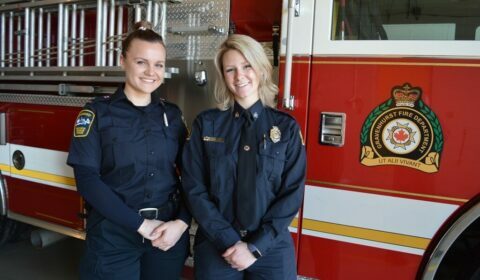 And they’ve produced a great video to explain it all, featuring bylaw officer and firefighter Kat Alizarchyk and Breyan Sinnott, a fire prevention officer. Gravenhurst bylaw officer Kat Alizarcyck, left, and fire prevention officer Breyann Sinnott explain the burning bylaw in a YouTube video. In it they say the bylaw and fire departments want to remind the public about burning regulations and safety. As of April 1, daytime burning is prohibited until Oct, 31. In Ward 1, all open air burning is prohibited at all times. Areas outside of Ward 1 are permitted contained and supervised fires (2) hours before sunset through to (2) hours after sunrise, however are not permitted to burn during the day. These factors are enforced pro-actively and on complaint basis throughout the burning season and can levy fines ranging between $200.00 to $350.00. If the fire is not a safety hazard and emergency services are not required, members of the community should call the Bylaw department to report a burning bylaw complaint,” said Dustin Gronc, manager of By-Law Services. The Town recognizes that the winter has been particularly hard on trees, shrubs and plants around properties and that there is likely a lot of dead-fall people wish to clean up. Instead of burning these materials we encourage you to take them to the local landfill where they will eventually be turned into mulch that can be re-used to keep our green spaces fresh and healthy.